We come in 2016 to the 11th edition of our festival and it will be again the ultimate reunion of all surf friends and fans from everywhere. 4 days of INSTRUMENTAL music drenched with REVERB and twangy guitars, some of the best surf bands active today and the definitive screenshot of the modern surf music scene! 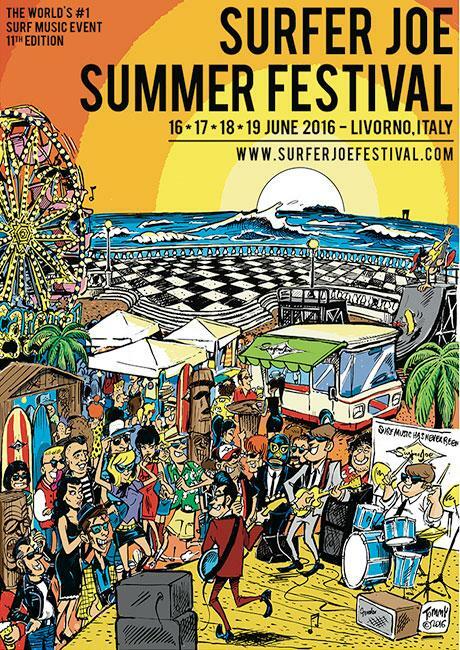 You HAVE to be there, you CANNOT miss this show, so that you will also realize why the Surfer Joe Summer Festival one of the most fun, complete and AUTHENTIC events worldwide. "Preventing physical stress from playing guitar and bass"
As a great source for modern and classic surf records, the Store will be present with a stand selling CDs, vinyls and merchandise by the performing bands and artists from all over the world. You are invited to send us pre-orders and requests that you will be able to pay and collect directly on site. The festival is a big opportunity to sell your records and get known by many people. Contact us to sell and showcase your records through our store. store@surferjoemusic.com. You will find several stands of vendors selling records, merchandise, memorabilia, clothing and more. The festival is not only a music event! The vendors area is open from mid-afternoon until late night. DO YOU WANT TO PARTICIPATE AS A VENDOR? At the Surfer Joe Diner and Food Truck you can find a large menu including burgers, salads, finger food, meals and sweets. There are veggie and vegan friendly offers. And don’t forget we have all day breakfast! The kitchen will be open from 10.00 to 1.00 no-stop during the festival days. Please be advised that it will NOT be possible to reserve a table. Come to try our special tiki cocktails presented last year: Wipeout, Surfer Grog, Italian Zombie. The Tiki Room - upstairs the Diner - is fully part of the event and will host the seminars and night concerts too! Extra our normal restaurant service we will organize a lunch for all festival fans at the Tiki Room upstairs the Diner. This is going to based on a special menu at the most convenient price. Our purpose is to enjoy the time together while ready for the day full of activities! If you need help or suggestions please feel free to contact us at info@surferjoemusic.com. Coming to the festival is very easy as Livorno is well located on the coast of Tuscany easily reachable from any direction and transportation. Fly to PISA INTERNATIONAL (PSA). Once you are in Pisa you need to get a train or a public transportation to get to Livorno. It is about 20 min. driving. Pisa is served by most low-cost airlines from Europe, check Ryanair, Easyjet, Germanwings for example. Take highway A12 direction south, you see the signs pointing to Livorno. Exit Livorno and follow the motorway until LIVORNO SUD. Exit there and follow the directions to the ACQUARIUM. The festival IS there. Look for station LIVORNO CENTRALE. Once in Livorno you can get a BUS, line #1, to reach the Terrazza Mascagni and the Acquarium. It is about 10 min. driving.